Agronomy is the science and technology of producing and using plants for food, fuel, fiber, and land reclamation. On M. Thaer's Principes Raisonne's D'agriculture. The high reputation attached to the author of this publication as a scientific and practical agriculturist, independently of his other claims to consideration, as well as the intrinsic character of the work itself, render it incumbent on us to no. tice it... The work, besides an appendix or atlas of various tables and plates, consists of four large octavo volumes... The second volume makes its appearance, with a long and able preface from the translator, which is in effect a digest of the principles of vegetation, and of agricultural chemistry. The second section is concluded at a very early part of this volume; and the third section commences under the head of agronomy, which, as the translator informs us, should be read with great attention, in order to extract its matter with full advantage to the reader. This section first treats of the component parts of soils, and the author goes deeply into this interesting subject, noticing at considerable length lime, chalk, marl, gypsum, the nature and effects of humus, and its different combinations with the elementary earths and atmospheric influences; and then succeeds a vast deal under the particular head of agriculture (first part), which, in our simplicity, we had imagined to have been essentially the subject on which we had been before engaged. This division comprehends first manures, animal, vegetable, and mineral, a sequence to the "constituent and physical properties of soils and the mode of judging of land," contained in the preceding division — agronomy — but designed principally to explain the modus operandi of manuring substances; with a great deal which seems in some respects a repetition of points previously discussed under the head of agronomy, and which might better have been included in it. Review of Albrecht Thaer's The principles of agriculture. Translated by William Shaw and Cuthbert W. Johnson. London, Ridgway, 1844. 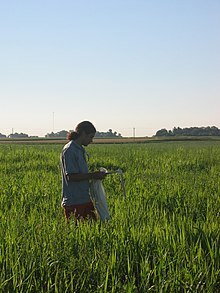 Agronomy; or a Treatise on the Constituent Parts and Physical Properties of the Soil, and the best Method of acquiring a Knowledge of the different Earths, and ascertaining their Value. Albrecht Thaer The Principles of Agriculture, Volume 1. William Shaw and Cuthbert W. Johnson (tr). Ridgway, 1844. p. 258: Title and subtitle of section III of the book. John Wrightson (1887) Agricultural text-book: : embracing soils, manures, rotations of crops and live stock, adapted to the requirements of the syllabus of the Science and Art Department, South Kensington. p. 9. Notwithstanding the willingness of many farmers, in spite of the knowledge and capital which many of thein have devoted to it, it is established that agriculture, or father agronomy, is still, in this country, only in an embryo state. The Legislature(1888) Sessional Papers. Vol. 21, Nr. 3, p. 77. … agronomy is this classification is divided into farm crops, crop pests, soils and fertilizers. University of Texas (1894) Bulletin of the University of Texas: General series, p. 20. Agronomy is that division of the Agricultural College work which relates to the field and its crops and has to do with investigation and instruction along the lines of (a) Farm management; the application of economic business methods to farm (b) Farm Crops; their production and improvement, (c) Soils; their fertility, cultivation, and improvement, (d) Farm Mechanics; the tools, machinery, fences and drains of the farm. Iowa Agricultural College (1895) Biennial Report of the Board of Trustees of the State Agricultural College and Farm to the Governor of Iowa and the … General Assembly, Vol. 16. p. 36; Also in: Iowa State College of Agriculture and the Mechanical Arts. Division of Agriculture Catalogue of the Division of Agriculture : agronomy, dairying, animal husbandry, horticulture, agricultural chemistry : science with practice : Ames, Iowa 1903-1904 (1903), p. 61. United States. Office of Experiment Stations (1897) Bulletin, p. 58. The word "agronomy" is the short way of indicating agriculture, horticulture, viticulture, arboriculture, dairying, breeding of live stock, beekeeping, &c.
South Australia. Dept. of Agriculture (1899) Journal of Agriculture and Industry of South Australia, p. 363. Biotechnology procedures that permit the easy asexual transfer of genes among microorganisms, when and if mastered for higher plants, hold the potential for transferring desired genes across species, genera, and perhaps family barriers. Let your imagination roam - the high lysine trait from the pigweed might be used to improve the quality of maize protein. 'The resistance of maize to wheat stem rust might be used to make wheat resistant to this disease. The gene for tolerance to Al[uminum] toxicity in wheat might make maize tolerant to Al[uminum]... The future for agronomy is not only bright, but it has no foreseeable bounds. Kenneth Frey' (1985:188-9) as cited in: Jack Ralph Kloppenburg First the Seed: The Political Economy of Plant Biotechnology (2005). The fundamental core of contemporary Darwinism, the theory of DNA-based reproduction and evolution, is now beyond dispute among scientists. It demonstrates its power every day, contributing crucially to the explanation of planet-sized facts of geology and meteorology, through middle-sized facts of ecology and agronomy, down to the latest microscopic facts of genetic engineering. Daniel Dennett Darwin's Dangerous Idea (1995). M.K. van Ittersum, ‎S.C. van de Geijn (1997) Perspectives for Agronomy, p. 10. Jim Cole, ‎Tony Stankus (2014) Journals of the Century, p. 448.